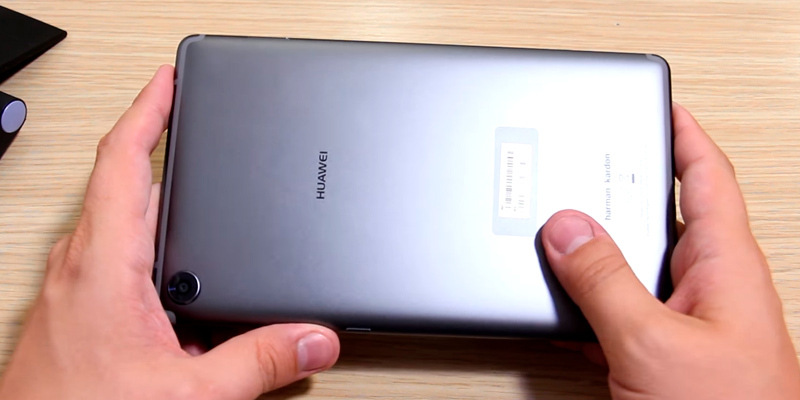 The device comes complete with the custom EMUI on top of the Android OS. This skin is way more flexible compared to stock Android. It will also make sure to leave more RAM for the frequently used apps. Lacks the 3.5mm mini-jack port. 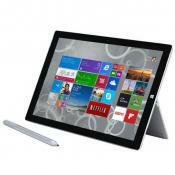 This functional device boasts a good operating system and an advanced interface. It has a pretty big screen and stereo speakers for a better experience when watching films and videos and a decent camera for taking quality pictures whenever you want. 4.91" x 8.37" x 0.29"
The USB Type-C combined with the Fast wall charger significantly boosts the charging time of the device. With the tablet, you also get 3 free months of Google play music and YouTube Red. And if you have kids, you can check Samsung’s child-friendly apps. The pre-installed Samsung software takes a lot of storage space. 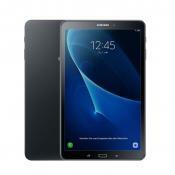 This model from Samsung suits those who seek a device not only for entertainment but also for work or studying. It is also suitable for family use since you can create a few different accounts. The model has 2 speakers at the front with Dolby Atmos support, providing you with surround sound with or without headphones. 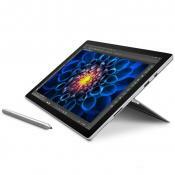 It is also one of the lightest options and it offers up to 20 hours of work on a single charge. The software update takes some time. 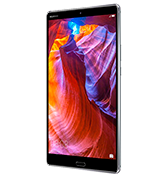 The Lenovo Tab 4 is an elegant device that will be liked by adults and kids alike, it is one of the fastest Android tablets in completing your everyday tasks and is great for watching your favorite TV shows. There is an option for LTE support as well. 4.9" x 8.3" x 0.3"
The device has a slot for an SD card that allows you to expand the memory up to 400 GB. 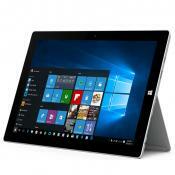 It will allow you to keep all your favorite media files and even some apps on your tablet. The rear camera could be better. 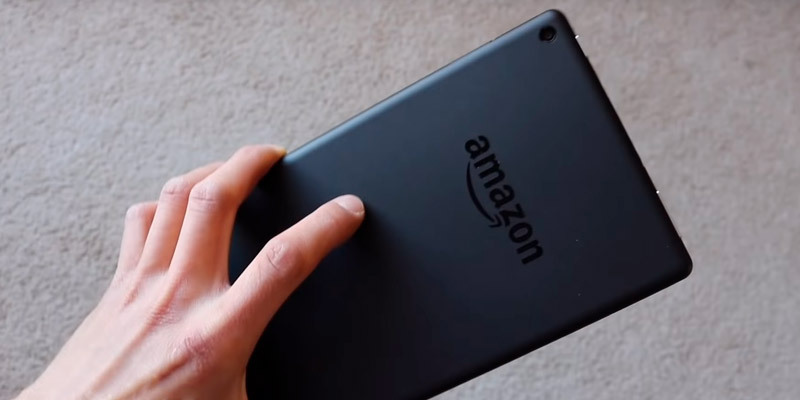 The Amazon Fire HD 8 is a good tablet for home use. This device uses the unique Fire OS and it is compatible with Alexa. It provides you with hands-free control and also gives access to a whole bunch of Amazon services. The 180° rotating camera offers a great way to take both rear and front photos. 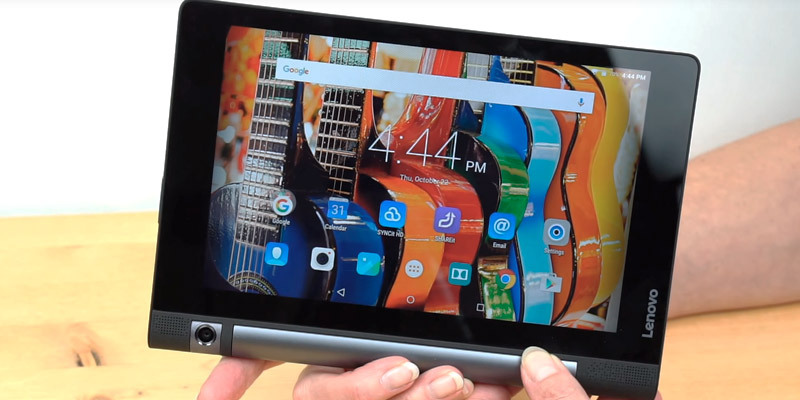 This makes the Lenovo Yoga Tab 3 model one of the best tablets for taking selfies, making Skype calls, and for using other means of video messaging with effortless ease. The sound quality is mediocre at the maximum volume levels. 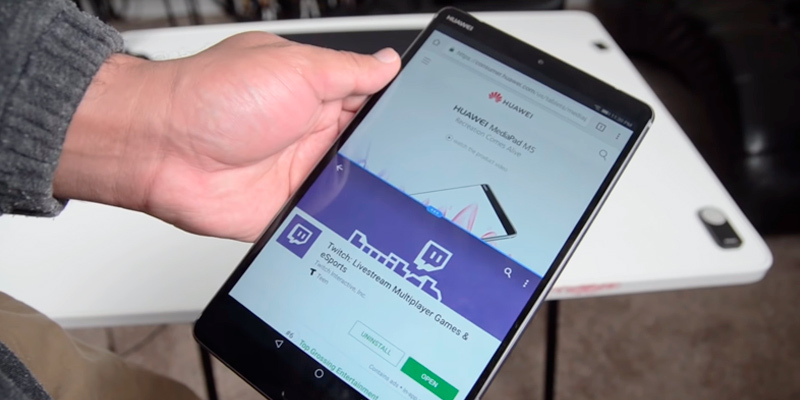 The Yoga Tablet from Lenovo will become your favorite multimedia device since it has a fairly powerful Qualcomm CPU and an impressive battery that lasts for almost 20 hours when fully charged. 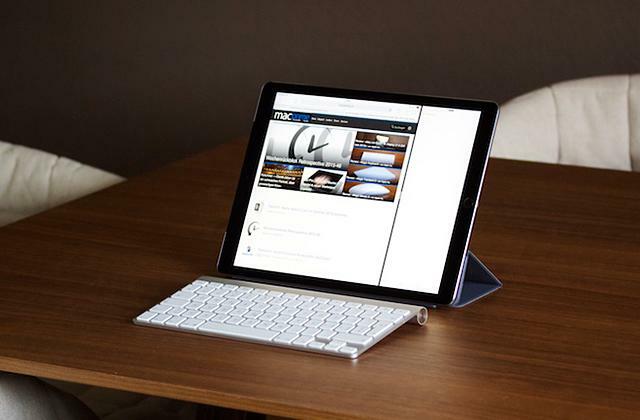 A unique kickstand makes the tablet easier to use in various situations. 5.74" x 8.26" x 0.28"
If you seek a functional device for everyday use, look no further. 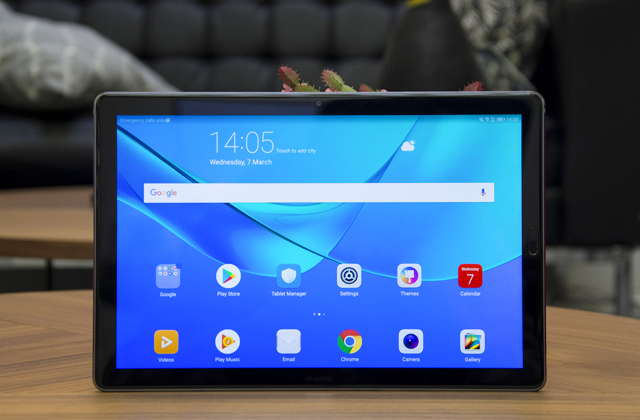 The Huawei MediaPad M5 is what you need to buy. 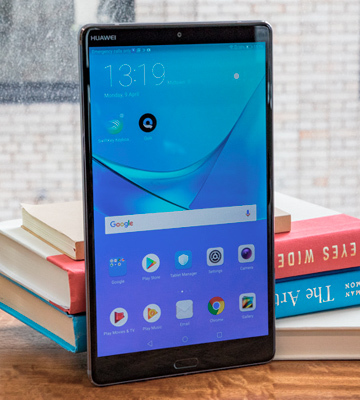 This model is called one of the best 8-inch tablets of 2018 on the market by Android Headlines and here is why. For starters, the device works on Android 8.0 Oreo, which is considered one of the best versions of this operating system so far. It is equipped with the Kirin 960 octa-core chipset. As for the interface, like most of the Huawei devices, it comes complete with the custom EMUI on top of the Android OS. This skin is way more flexible compared to stock Android. 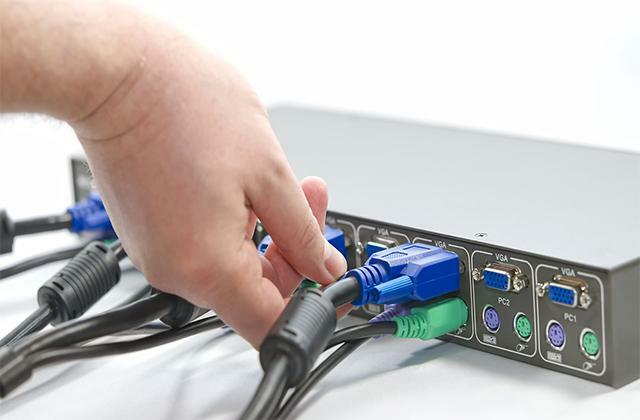 With this intuitive and easy to use interface you will be able to set many custom settings and make the device as convenient for you as possible. It will also make sure to leave more RAM for the frequently used apps. Speaking of which, the RAM of this Huawei tablet is 4 GB and the overall memory of the device equals 64 GB. The other great feature of the M5 is its display. This model features a 2.5D glass display. With the sharp 2K resolution, it allows you to enjoy a wider view and miss no detail. The screen has a diagonal of 8.4 inches, yet the overall size of the table isn’t much bigger than most of the other 8-inch tablets (4.91" x 8.37" x 0.29" ). Thanks to the 82 percent screen-to-body ratio, you will be able to see every detail and enjoy the wide high-quality view. For an even better experience, the MediaPad M5 is fitted with dual stereo speakers that provide you with excellent voluminous sound. The camera of the MediaPad M5 is pretty decent. The front facing camera has a resolution of 8 MP and the rear camera boast 13 MP. You will be able to capture all your special moments in high detail. As for battery life, this mini tablet lasts for about 11 hours. It is enough if you don’t plan to take it on long rides. It also features a quick charge function, so it will take you about 2 hours to charge the device completely. The device is also fitted with a little extra feature - a fingerprint scanner. It will help to secure your data and give you easy access in just one touch without memorizing any passwords. The only disadvantage of this model is that is doesn’t have a 3.5 mm jack port. Yet, if you own a pair of wireless earbuds or wireless headphones, it won’t be a big problem for you. In conclusion, the Huawei MediaPad M5 is a functional device that boasts a good operating system and an advanced interface. It has a pretty big screen and stereo speakers for a better experience when watching films and videos and a decent camera for taking quality pictures whenever you want. It is fair to say that the Samsung company is one of the most famous giants in the electronics industry and needs no introduction. Their Android smartphones are in huge demand among many users all over the world. Their tablets are not far behind as well. 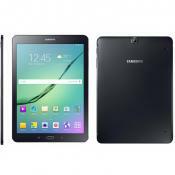 The company presents the Galaxy Tab A, one of the best 8-inch tablets. 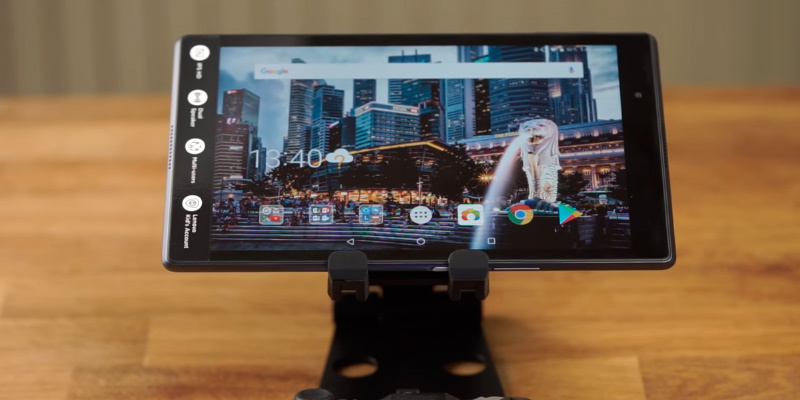 The device uses Android 7.1 Nougat installed along with the Qualcomm processor, which is considered to be among the best hardware for tablets and phones. 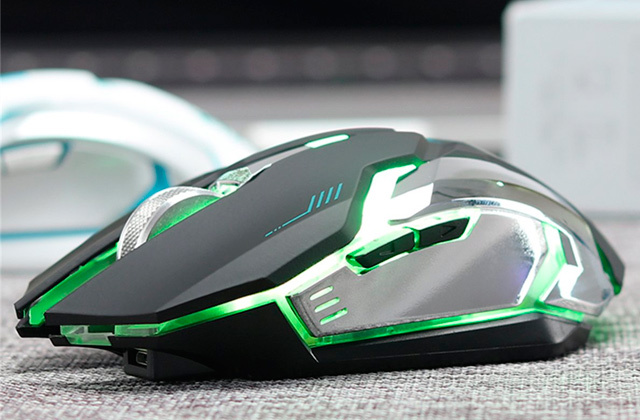 It is powerful enough not only to provide you with entertainment like watching films and playing music but it can also deal with your basic working tasks. Hence, it is great for work and studying as well. This tablet is also suitable for family use. You can create several accounts on it and share with your relatives, which is very convenient. Since we mentioned entertainment, we also want to add that the max resolution of the 8-inch screen is 800 x 1280 pixels and it provides you with a quality picture at any light. The graphics processor is the Adreno 360, which makes playing video games and watching videos a real treat. The rear and front cameras are 8 and 5 MP respectively, which may not sound big, but the pictures will turn out to be pretty good. As for the connectivity, this small tablet has Bluetooth 4.2 and Wi-Fi. It is also complete with a standard 3.5 mm audio jack. The battery of the tablet lasts for a good 15 hours. We also like that it has a short charging time. The USB Type-C combined with the Fast wall charger significantly boosts the charging time of the device. Thus, you can have no worries: it will definitely survive a day at work or at school. What is more, when purchasing this model, you get 3 free months of Google Play music and YouTube Red. And if you have kids, you can check Samsung’s child-friendly apps. The weak spot of this tablet is its memory. 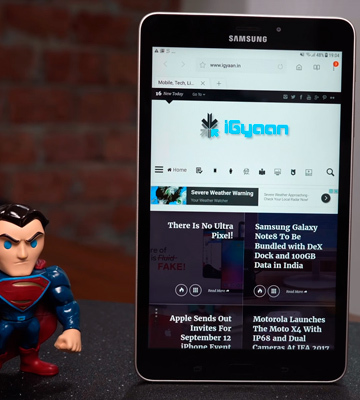 The RAM of the Galaxy Tab A is 2GB, which is not that much. Unfortunately, like all Samsung devices, this one comes with pre-installed Samsung software, which takes a lot of memory. Hence, instead of claimed 32GB, you will get only about 25GB. Luckily, the device comes with a slot for an SD card, so you can expand the memory up to 256GB. 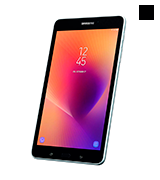 In short, the Samsung Galaxy Tab A is a good model from a famous manufacturer for those who seek a device not only for entertainment but also for work or studying. It is also suitable for family use since you can create a few different accounts. When talking about the quality-to-cost ratio, there is no way we can avoid mentioning the Lenovo Tab 4. 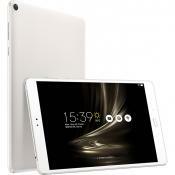 This small Android tablet (and it is small, 8" in diagonal) at a fairly affordable price will offer you high performance and a variety of features. For starters, it offers up to a whole 20 hours of work before you need to recharge it. Well, under perfect conditions, of course. 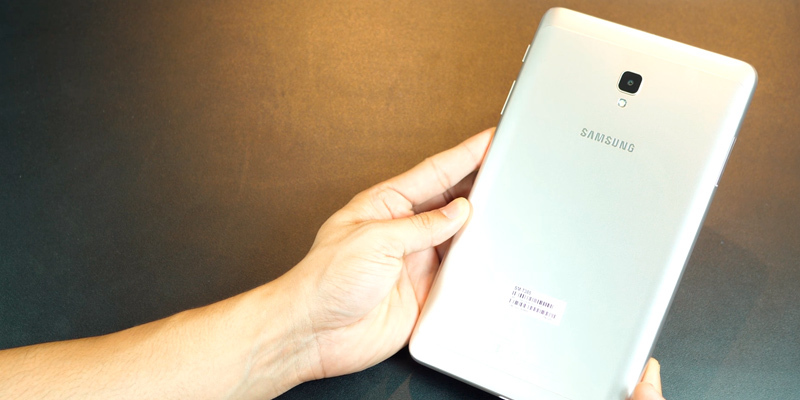 The gadget is based on the quad-core Qualcomm Snapdragon 425 processor. Although it is not the latest Snapdragon generation processor—that would be Snapdragon 845—it is still one of the fastest and the most advanced there is today. To be fair, a tablet on an 845 platform would cost you quite a bit more, too, whereas what we have here is a more or less budget-friendly gadget. Let's get back to the actual topic, though. 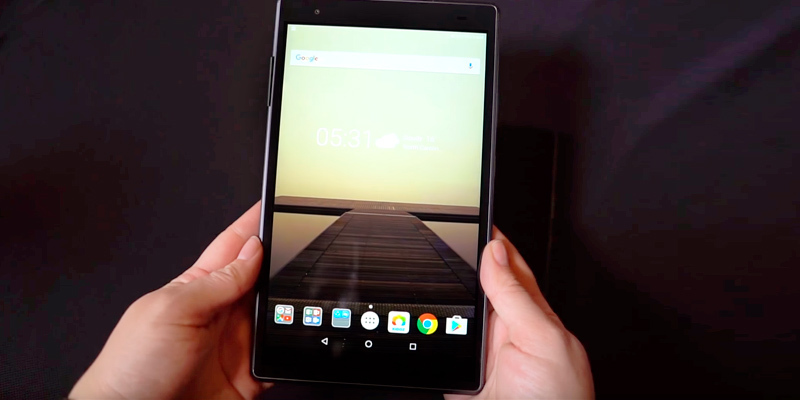 Besides one of the most powerful processors, this 8-inch tablet is equipped with 2GB RAM, which is, again, not the largest available today but not the smallest either. Generally, you see this RAM volume in bigger tablets, though, for an 8-inch model, it is a really good choice. The Lenovo Tab 4 has an IPS display with a 1280x800 resolution, both quite usual for a tablet of this size. IPS will allow you to see what's on the screen from almost any angle and in the daylight, which is the reason IPS panels are used in most of our portable gadgets now, and the HD resolution is probably the biggest you need for an 8-inch display, bigger will result in too small icons and too much energy draining for no particular reason since appreciating details on a small screen is not all that easy. Usually, a portable gadget like a tablet is a very personal thing—we have our social accounts on them, mail, personal content and so on. But when your family is on a budget, you will probably have to share at least sometimes so you'll think twice before adding something that is for no one's eyes. It's stressing. But not with this model, no. Lenovo Tab 4 is a tablet for your whole family, kids and adults alike. It offers you the possibility to create several accounts, one for each user. With your own social media accounts, passwords, and other important stuff. This includes accounts for kids. With an add-on Kids’ Package, you can set time restrictions so that your little one does not spend a whole day glued to the screen. It will also filter inappropriate content, relieving you from the necessity to keep an eye on the child's use of the Internet continuously. And the Kids' Pack also includes a couple of bonuses that will please children as well as parents: a blue-light screen filter to keep eyes healthy, a shock-resistant bumper for when the kids are clumsy, and stickers—basically, just for fun. 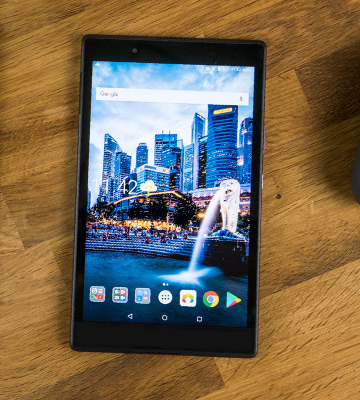 Be it work-related tasks, watching a movie via Netflix app, or playing a game—this small Android tablet will perform exceptionally. 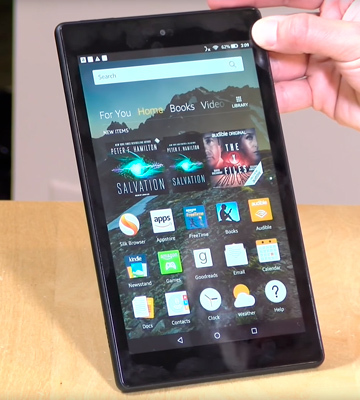 The Fire HD 8 is a decent tablet engineered by Amazon. It has a lot of unique features to offer yet it comes at a budget-friendly price. First, this gadget is compatible with Alexa. This voice control function allows you to use your device from a distance and leaves your hands free. You can turn the music or video on even when your device is on the other side of the room. Also, with the help of Alexa, you can control all the other smart devices around your house. The device works on the Fire OS 6.0 which is based on Android 7.1 Nougat. 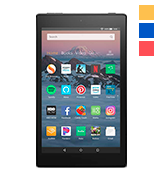 With this small tablet, you will have access to multiple services including Amazon Prime, Spotify and Pandora. With the Prime Free Trial, you will get thousands of songs, books, and films right at your fingertips. You can download all your favorite movies and TV episodes so you stay entertained even if you are not connected to Wi-Fi. And speaking of wireless connectivity, apart from Wi-Fi, the device features Bluetooth 4.1. The next prominent feature is a Show Mode. This is also the Alexa hands-free option that provides you with a full-screen HD experience while watching videos or scrolling down the pictures. The resolution of the screen is pretty average for an 8-inch tablet (800 x 1280) and it has more than a million pixels. The image will be bright and vivid and you will be able to clearly see it at any angle. So, just ask Alexa to play your favorite film, sit, relax and enjoy! 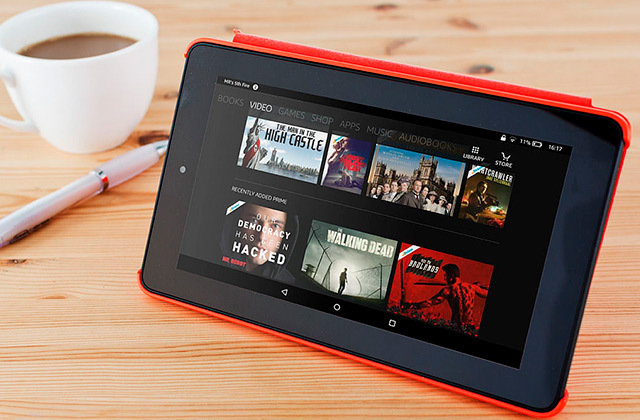 The Fire HD 8 is fitted with 1.5 GB RAM and has 16 GB of storage memory. If this isn’t enough for you, the device has a slot for an SD card that allows you to expand the memory up to 400 GB. 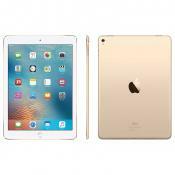 It will allow you to keep all your favorite media files and even some apps on your tablet. This tablet also features an interesting bright design. Apart from classic black, there are also options in Canary Yellow, Marine Blue and Punch Red available. We also want to mention the appealing price of this tablet. This device from Amazon has a full set of convenient features yet it won’t cost you much. So if you seek a decent tablet for entertainment yet you don’t want to spend a lot, we recommend choosing this option. What we don’t really like about this gadget are the cameras. 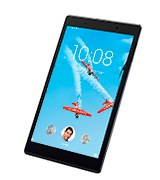 The Fire HD 8 is fitted with a rear and front cameras that are 2 MP each. The picture quality leaves much to be desired, and a lot of users point out that the manufacturer could make the rear camera a bit better at least. To conclude, the Amazon Fire HD 8 is a good tablet for home use. This device uses unique Fire OS and it is compatible with Alexa. It provides you with a hands-free control and also gives access to a whole bunch of Amazon services. 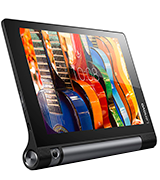 The Lenovo Yoga Tab 3 is a solid middle ground solution if you are looking for an affordable and high-performing device. Although the retailers try to update all Lenovo models in time, sometimes the devices that have been in the storage for too long can be delivered with factory versions of the Android OS. Thus, we recommend updating the tablet to the latest supported version of the Android OS before using some of the more demanding applications. 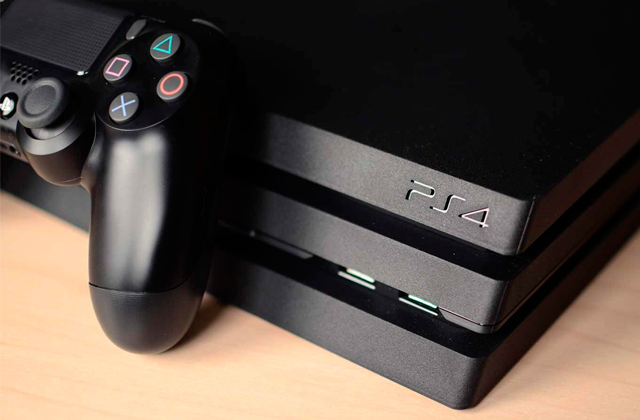 Otherwise, you may face stuttering and lags during playback of media files, online videos, or while playing games. The Lenovo AnyPen feature allows for using any conductive element as a stylus pen to make quick notes or making routes on the map. You can even draw pictures this way, though the sensor is less accurate compared to the drawing tablets, so this feature will be more suitable for simple sketches rather than for fully-fledged digital paintings. Unlike many of the Yoga’s competitors, its battery life impresses rather than disappoints, being able to work for up to 20 hours from one full charge. 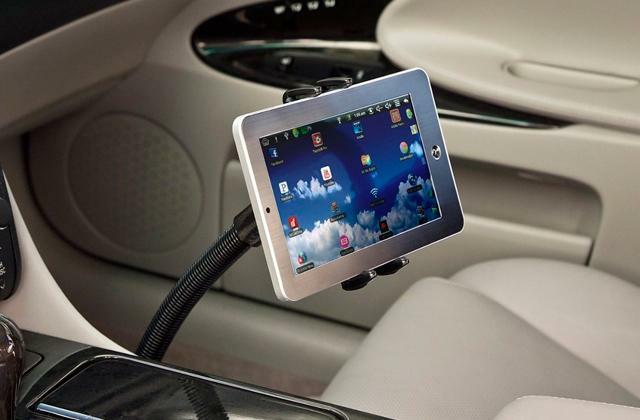 Hence, it is the best 8-inch tablet for use on the go in the long trips. 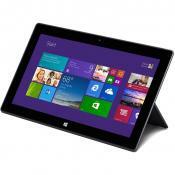 Moving on, the specifications of the tablet make it perfect for many different purposes. On top of that, the model features a kickstand that can be adjusted to 4 positions. 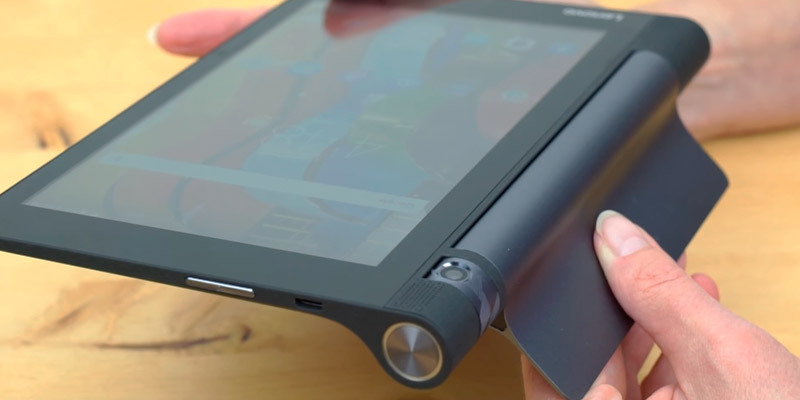 You can hang the tablet or put it on the table just like a regular laptop (even though it doesn’t have a keyboard), the possibilities are virtually endless since the kickstand can be turned up or down 180°. Speaking of degrees, the gadget has a single 8MP camera instead of two that can be turned however you want, which makes it so much easier to hold the kickstand with one hand while taking selfies at the same time. 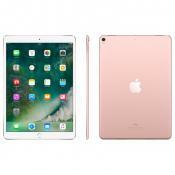 The 8-inch IPS screen may not be enough to surprise most of the customers nowadays but it does deliver a stable image quality at low to medium frame rates, while the 800x1280 resolution of the 8-inch tablet's display makes it more than enough for watching your favorite movies or TV series. Despite the fact that the tablet has a quad-core CPU, the clock rate of each one barely reaches 1.3 MHz, which, in combination with 2GB of DDR3 RAM, may lead to occasional stuttering and hiccups since 400 MHz of the said clock rate is a bit low by today’s standards. To avoid that, we recommend restarting the device at least once a week so the RAM will be able to reset itself. Alternatively, you can tinker with the system settings in order to allocate more or less ram to applications that require a lot of memory to run. 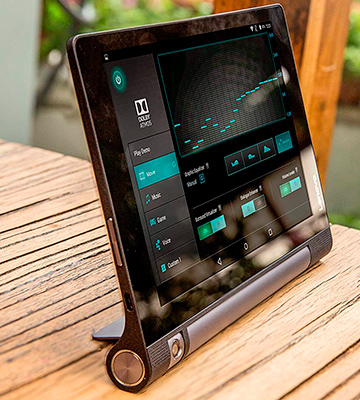 All in all, the Lenovo Yoga Tab 3 is a great budget-friendly tablet that is still capable of competing with top-of-the-line models when it comes to performance and speed. What Is an 8-inch Tablet? 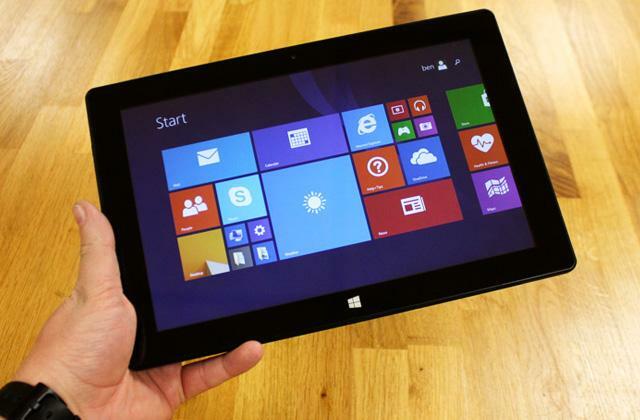 A tablet is a portable device that features some sort of operating system, a touchscreen and a rechargeable battery. It combines features of a smartphone and personal computer, yet it lacks some input and output abilities of the PC. 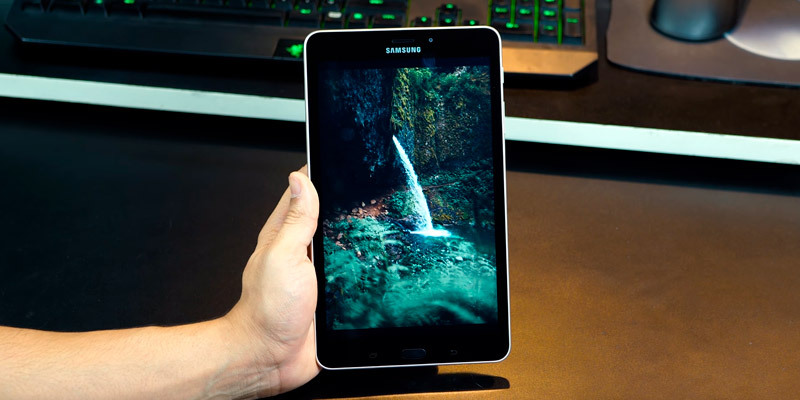 Generally, tablets resemble a smartphone, but they have a larger size. The other difference is the hardware. Hence, even if your phone and tablet share the same OS, you may notice some differences in their functionality. 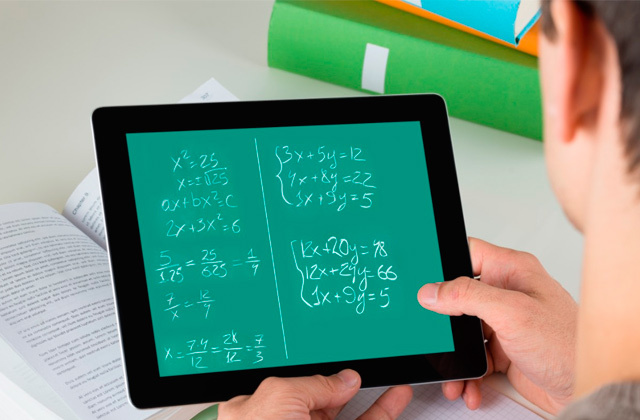 The most obvious advantage of the tablet is its high portability. Even though laptops have become thinner and lighter, they are still bulkier than a tablet which provides you with pretty much the same functionality as a laptop. It can easily fit in your bag or even a purse, especially if you own an 8-inch model. What is more, the touch screen is one of the most convenient interfaces that will be easy to use even for a newbie. In our review, you can find the 5 best 8-inch tablets for use on the go. 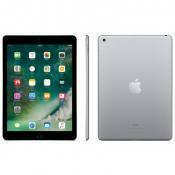 We also have a selection of the top 10-inch tablets and tablets for college students. 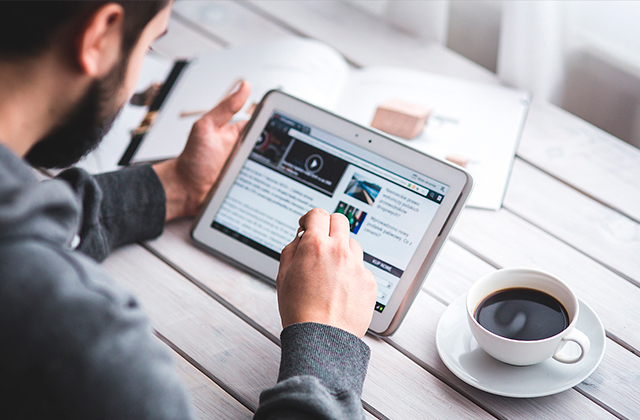 When buying a tablet, there are several things you need to pay attention to. The first one is the display. Needless to say that the screen is your main tool for controlling the tablet, hence choose wisely. 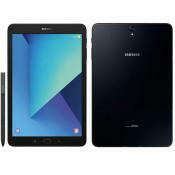 If you need a device for basic tasks or need something compact, an 8-inch tablet will fit you best. 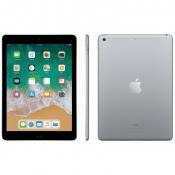 However, if you specifically want a gadget for watching movies or maybe even drawing, you can buy a large screen tablet ( there are options up to 14 inches available). You also should look at the display resolution. The optimal resolution for 8-inch tablets is 800 x 1280 pixels. Keep in mind that the bigger the screen is, the higher the resolution should be. 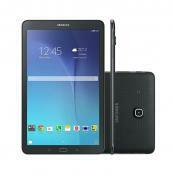 All the tablets on our shortlist work with Android, a mobile operating system designed by Google. Since the company releases an updated version of this OS almost every year, some of the devices update automatically while others may not be compatible with the newest versions of Android. In addition to this, some companies come up with their own OS based on some version of Android. They may not be that different, but they are more flexible and allow you to make more custom settings. Pretty much all the gadgets, whether it be a PC, a laptop, a smartphone or a tablet PC, have Random Access Memory (or RAM) and general storage memory. RAM serves for system components and apps. 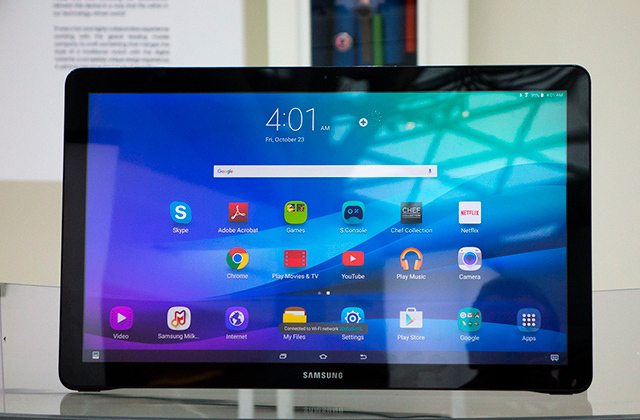 The larger it is, the quicker your tablet will respond to the tasks and commands. Generally, the random access memory varies from 1 to 4 GB. The onboard storage is used for your personal data and media files like photos, videos, music and books. 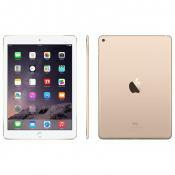 Tablets usually come with 16, 32 or 64 GB, but there are other options available as well. And if your device has a slot for an SD card, you can expand the storage with its help. The battery life of a tablet can be pretty different as well. Some models last for only a few hours while others can serve you for 20 hours on a single charge. That’s why, when selecting a gadget, you should decide what you need it for. If you want a device for home use and you will have access to the charger, short battery life shouldn’t be a big turn off for you. However, if you need one to take with you on a long ride, purchase a model with a bigger capacity. Do note that different tasks and apps affect the battery charge in a different way. Lastly, there are a few extra features your tablet may have. The camera is among them. Your tablet may feature rear and/or front cameras. They can have the same or different amount of pixels which usually starts at 2 MP and goes up to 13 and 16 MP. Hence, if you like to take a lot of selfies or you plan to take quality landscape piсtures, choose the one with the better quality. The other popular feature that you can find in modern gadgets is a fingerprint scanner. It gives you easy access to your device in just one touch and securely protects all your personal information. Also, when buying a tablet, you may want to check out such parameters as size, weight and body color. Some may find this statistic surprising but the most popular tablet activity has nothing to do with work, any form of videos or internet in general. It is actually video games with movies and TV shows trailing behind them in popularity. 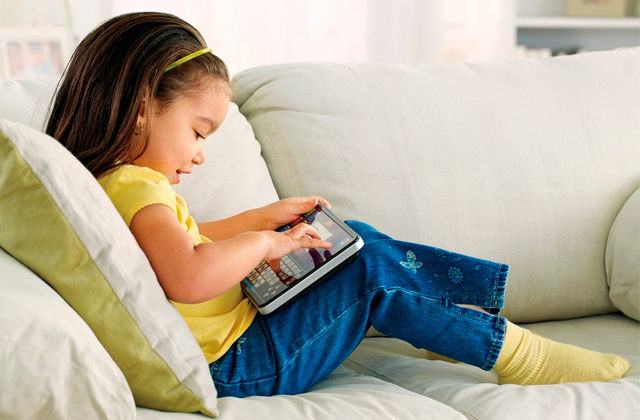 About 84% of tablet users tend to spend at least a few hours a week playing video games on their favorite device. But that isn't even the remotely the most peculiar possible application for your tablet. The honor and privilege of bestowing that title would have to go to those bright folks that figured out that you can use your touchscreen device to tune your guitar. Professional and aspiring musicians usually tend to carry electric guitar tuners with them. But if you're an intermediate player that just wants to quickly tune his favorite musical instrument, or you would like to have a backup guitar in case your band is on tour, all you have to do is download Guitar Tuna, a free Android and iOS app that will do that job for you.